Entergently: Why I have been MIA most of the summer! Congratultions! I am so happy for you and your family! Also, on a more selfish note, I am excited for myself- I am pregnant with my second child (due March 30). I love your blog and feel so much support from it. I am still nursing my 2 y.o. 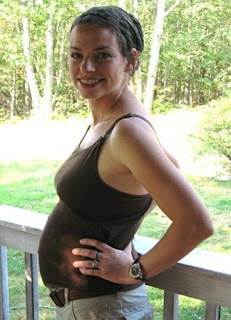 son and would love to do an unassisted homebirth. Congratulations again, you look great! Congratulations! 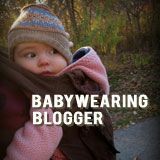 I laughed as soon as your blog page loaded and I saw your picture! I'm pregnant again too :) with baby #6(actually it's #7 but because one didn't make it much past birth because of "non-genetic" birth defects this will be our 6th living-I think I've told you about that before). I'm 23 weeks. I'm excited for you! And glad to know I'm not the only mom who starts showing waaaaay early! Another reason why I love your picture hee hee! I measure slightly smaller than my dates and baby seems to be 'right on' in size according to the one ultrasound we had(to make sure everything was a-ok with baby). My Mom sees me on the webcam the other day and asked to see my belly...she then says,"Wooow Jaime you look B-I-G for 5 months!" I haven't even gained as much weight as I normally do! LOL! I was thinking....Ummm Mom this is my SEVENTH time around this block,it's not my first baby! *chuckle*!! I'm excited for you Kelly and hope for a happy,healthy baby that just might be a girl. :) (they said ours looked most likely like a boy but we'll see. Our last 4 in a row have been girls!). Best wishes! Wow! Congratulations! We're not pregnant yet but I'm more and more thinking about UC or home birth. I also feel kind of silly saying "due date" or that my baby was 7 days "late". They come when they're ready! Congratulations! I'm working on our first (at about 36 weeks now). We're planning a homebirth with a midwife. I've really appreciated your other site where you talk about your different births and stuff. We're excited! We also bought a Kozy recently, and we're excited to use that too! Congratulations, Kelley! How wonderful for the LORD to bless you with another precious soul.